Ever since making the switch to a healthier, more holistic way of life, I’ve had a bottle of castor oil in my bathroom cabinet. I’ve lost count of the number of times it’s saved my skin (literally! ), and it’s become so invaluable to my healthcare routine that I often take it with me whenever I travel. The reason I and so many other holistically-minded people are so enamored with castor oil is its versatility: it can prevent infections from developing, treat constipation, support healthy hair, boost the immune system, amplify the effectiveness of therapeutic essential oils and plenty more besides. Provided you’re dealing with pure, undenatured castor oil, that is. Castor oil has a long and rich history. The Ebers Papyrus, one of the oldest medical textbooks on the planet, makes reference to the ancient Egyptians using castor oil for therapeutic purposes as early as 1550 BCE. Early Japanese societies employed the healing powers of castor oil as part of their healing practices, and in certain parts of the world, castor oil was referred to as palma christe, on account of the fact that its leaves are reminiscent of the hands of Christ. Castor oil is produced by cold-pressing the seeds of Ricinus communis, a plant native to India. The oil of the seeds is extremely high in ricinoleic acid, a fatty acid thought to be responsible for most of castor oil’s healing powers. Aside from this rare source of ricinoleic acid, castor oil also contains decent concentrations of beneficial salts and esters that function largely as skin-conditioning agents. Because of castor oil’s high levels of ricinoleic acid, it does have the potential to cause problems in some people. The age-old practice of giving a spoonful of castor oil to children suffering from stomach ache or showing signs of a cold probably isn’t a tradition to continue, on account of its ability to cause digestive upset like diarrhea and cramping in higher-than-recommended doses. And while it’s active ingredients have been proven to be temporary and non-toxic, castor oil is best left outside of your body. Okay, so castor oil isn’t ideal for internal use… but when it comes to rubbing a little on your skin, it’s beneficial effects are nothing short of miraculous. And one of the best ways to get the most benefits is through castor oil packs. Castor oil packs are designed to take the already legendary healing powers of castor oil and amplify them significantly. In a nutshell, sections of cloth are soaked in castor oil, overlaid with a heat pack, and left on the skin for at least an hour. It’s not rocket science, but trapping castor oil against the skin and introducing an external heat source, the castor oil is forced to deeply penetrate the skin and act on internal areas of issue, like overtaxed organs or sluggish digestive systems. And unlike taking a swig of castor oil, the chances of any adverse side effects are slim. In essence, the castor oil packs temporarily, but significantly, boosted the immunity of the study participants. The constipation-busting abilities of castor oil are widely known, but in order to get that poop flowing once more a person has to swig back a healthy dose of castor oil. And as I explained earlier, this isn’t the best idea. Luckily, castor oil packs provide a safer, easier solution. A 2011 study published in the Journal of Complementary Therapies in Clinical Practice examined the effect that castor oil packs had on constipated elderlies. To cut a long story short and spare you the gory details, applying castor oil packs for three days was able to produce significant results in terms of ease of pooping and general symptoms of constipation. Beats those nasty oral (or otherwise!) laxatives, if you ask me. The high concentrations of ricinoleic acid present in castor oil support a healthy lymphatic system, an important role of which is to expel toxins from your body. In people suffering from arthritis and other forms of inflammatory joint pain, there’s often a buildup of toxins in and around the joint, which can elevate inflammation and increase pain while restricting movement. A 2009 study published in the Journal of Phytotherapy Research verified this, with two to four weeks of castor oil treatment providing significant improvements in patients with knee osteoarthritis. To try it yourself, apply castor oil packs to inflamed or sore joints for a great way to alleviate pain and improve mobility. The fact that it’s a non-invasive, side effect-free treatment doesn’t hurt either! The bucketloads of antioxidants and fatty acids found in castor oil make it an excellent choice for a chemical-free skin moisturizer. Due to its thick consistency, it’s great for locking in the moisture and deeply penetrating the skin pores, helping to provide a lasting moisturizing effect. Applying a castor oil pack to an area of your skin that’s dry, irritated or in need of some serious TLC is a great idea to produce rapid results. Applying the pack once a day for up to a week should see considerable improvements, but remember that castor oil is potent stuff and to use it sparingly! 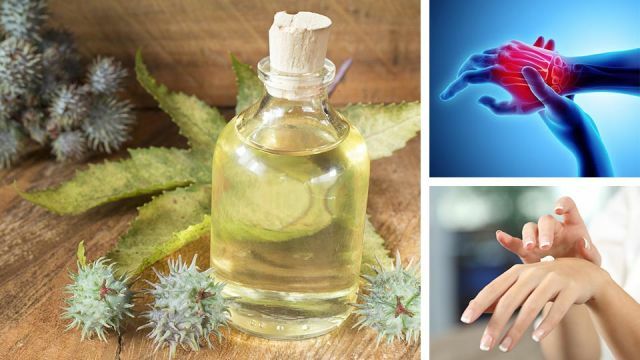 Castor oil packs can be used a way to speed healing and prevent infection of minor cuts and wounds, on account of its antibacterial and anti-inflammatory properties. It’s said that these properties can also be used to diminish signs of scarring and other semi-permanent skin imperfections. While castor oil packs can be bought in some health stores or ordered online, they’re easy enough to make yourself from the comfort of your own home. Be sure to follow the instructions correctly to avoid a mess! Fold the wool or dye-free cotton over three times to create three layers, adapting the size of the cloth to the area of your body where you plan on using it. Put the wool or cotton in the large glass jar, then pour in a little castor oil and mix or shake the jar to distribute the oil into the cloth. It may take some time for the oil to completely soak into the cloth, so be patient. Once the cloth is soaked with castor oil but not saturated, proceed to the next step. Lie down on an old towel or sheet, and remove the castor oil-soaked cloth from the jar. Place it on the desired body part, then cover with large piece of cotton flannel or plastic wrap, and put the heating pad or hot water bottle on top of that. Lie with your feet slightly elevated for 30 to 60 minutes, to allow the castor oil to really soak in. View this time as a form of meditation, and focus on slowing your breathing and calming your mind. Afterwards, gently wipe the area of skin with a damp cloth to remove any excess castor oil. Hey Buddy!, I found this information for you: "Fix Constipation + 4 More Reasons You Need Castor Oil Packs In Your Life". Here is the website link: https://www.thealternativedaily.com/5-reasons-you-need-castor-oil-packs-in-your-life/. Thank you.